Upcycling City - KRASS e.V. …the arts working group of KRASS e.V. enters the third round in 2016. Once a week, currently on Mondays, the students of Alfred-Herrhausen-School, set up in a fixed group, make an effort to develop their artistic potential. 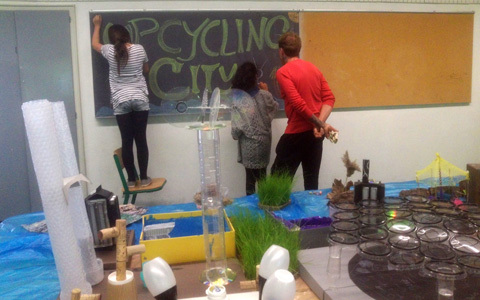 While in 2015, the kids used recycling material to create artistic pieces which they later presented in the exhibition “Upcycling City”, in 2016 the project is dedicated to the topic “Working with wood”. This year the students, guided by a supervisor, learned how to safely handle a fretsaw, hammer or drill, giving free reign to their own creativity. Working together in a common creative process helps the kids to promote and develop their social competencies and communicative skills. The project is currenly carried out on Mondays at the Alfred-Herrhausen-Schule, Vennhauser Allee 167, Düsseldorf, under the guidance of the artist Barbara Rückert.